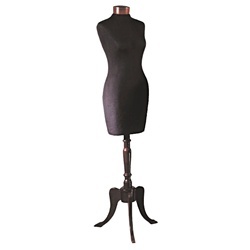 Our pinable female dress form is covered in cream colored lycra fabric. She has an egghead that is removable if you prefer a headless look. She has a wooden neck block and choice of tripod or square base. Her arms are made of simulated wood and are completely posable.